Everything was absolutely perfect. My wife and I showed up on the coldest night of the year to date, and were greeted with a tray of delicious hot chocolate in fine china. Despite us being only one of two rooms occupied on this night, no holds were barred with breakfast. Homemade scones, ham/egg/cheese cups and potatoes – oh and of course the crepes that my wife couldn’t stop talking about. Thank you, Park House, we will be back. ~Eric S.
The modern city of Binghamton was settled in the decades leading up to the American Revolution. Here is a nice synopsis of its history. Visit our local museums to find out more about some of the iconic businesses, like IBM and the Endicott Johnson Shoe Company, that got their start here in the Binghamton area. And here are some of our favorite things to do, and places to eat, in the Binghamton area. Cool, relaxed environment. Something for everyone with reasonable prices. We send all of our B&B guests here. Everyone thanks us later. 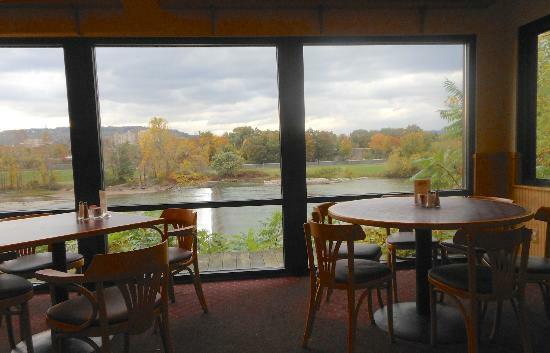 Classic diner menu and ambiance, fair prices, and a cool location on the bluff overlooking the Susquehanna River and downtown. A great way to visit the area and have a little retro fun! Check out the visitor’s bureau website for more cool stuff in the Southern Tier. Captain Pamela not only helps run the B&B, she teaches sailing and runs sloop charters on Cayuga Lake. A great activity for a summer weekend! Personally, we’re fans of the up-close-and-personal style of baseball in smaller arenas. An evening at NYSEG Stadium with the AA league Rumbleponies is a terrific family outing at a great price.